The one who helps us cross the ocean of suffering. 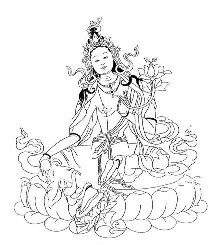 In 1997, in the early stages of Vince’s own recovery from alcohol dependency, he first came across Buddhism and in particular Green Tara as the ‘the one who enables living beings to cross the ocean of samsara (existence and suffering)’. Green Tara (whose name means “star” or “she who ferries across”) is the female Bodhisattva of compassion. In particular she represents compassion in action, since she’s usually depicted in the process of stepping from her lotus throne in order to help sentient beings. Her green colour and image has always stuck with me. In fact, I have undertaken some basic instruction in TARA practice at the Kagyu Samye Ling Monastery and Tibetan Centre in Scotland. The Tara-like qualities of Luangpor Yai are unmistakable. Mian Parnchand, like her nephews Chamroon and Charoen, shared links to traditional herbal medicine. She inherited the knowledge of herbal medicine treatment for various diseases from her ancestors. She was a Buddhist nun having ordained herself under a banana tree. 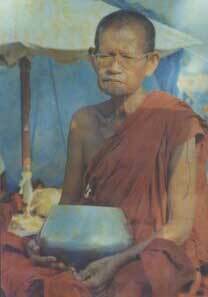 Although there is no official Buddhist order of nuns, she had by her wisdom, devotion, sanctity and by all accounts prophetic powers earned her the deference and respect accorded to Buddhist monks and she was called LUANGPOR YAI or “Senior Father”. With her two nephews she established Thamkrabok Monastery in 1957. She was obviously in contact with high spiritual realms. Luangpor Charoen called her “a talking bible”, Luangpor Chamroon “a visionary”. Her influence on Thamkrabok as a monastery and on the treatment of drug addicts as a whole cannot be understated. She is the most venerated person in Thamkrabok Monastery. The Tara-like qualities of Luangpor Yai are unmistakable. As an acronym for Thamkrabok Assistance and Recovery Advice, TARA Detox is perhaps a contrived name but it sounded and felt perfectly acceptable and quite suitable for the help I hoped to provide at that time.